Romney Repeats No-New-Tax-Releases Stance, Defends Offshore Accounts : It's All Politics Romney tells conservative National Review he doesn't want to release pre-2010 tax returns because it will give Obama fodder to "lie, distort." Mitt Romney leaves a fundraiser in Baton Rouge, La., on Monday. 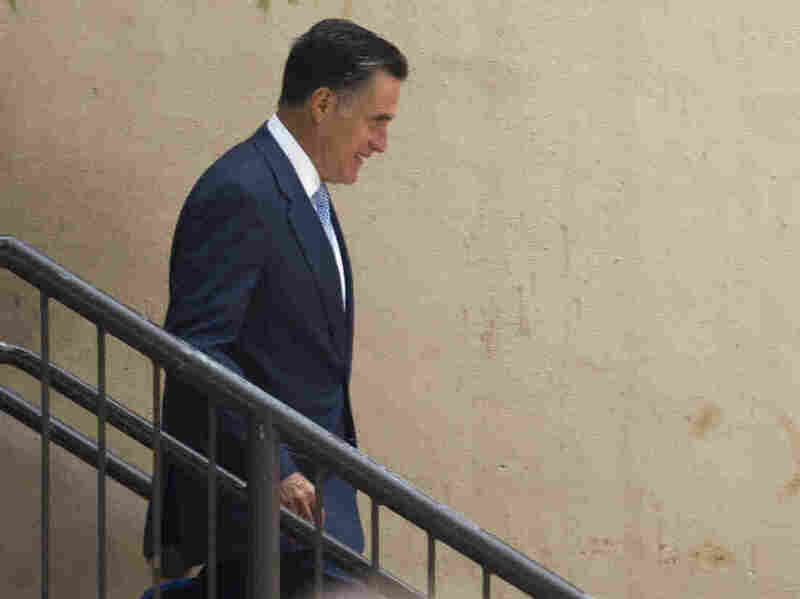 Republican presidential candidate Mitt Romney continued Tuesday to push back on calls to release more years of tax returns and defended keeping investments in offshore accounts — both issues that have been dogging his run for the White House. In an interview with Robert Costa of the conservative National Review, Romney said he won't release pre-2010 tax returns, despite urging from those within his own party, because he says he believes the Obama campaign would use them to "distract from the failure of the president to reignite our economy." "And I'm simply not enthusiastic about giving them hundreds or thousands of more pages to pick through, distort and lie about." "The decisions made by the trustee are the decisions that determine where the investments are." As has been reported in recent months, and also during his 2008 presidential run, Romney referred to Sen. Edward Kennedy's use of a blind trust to manage his money as "an age-old ruse" during the 1994 Massachusetts Senate race. "You give a blind trust rules. You can say to a blind trust, don't invest in properties which would be in conflict of interest or where the seller might think they're going to get an advantage from me." In his interview Tuesday, Romney also defended his offshore accounts as a vehicle through which foreign investment can flow to companies in the U.S.
"The so-called offshore accounts in the Cayman Islands, for instance, is an account established by a U.S. firm to allow foreign investors to invest in U.S. enterprises and not be subject to taxes outside of their own jurisdiction. So in many instances, the investments in something of that nature are brought back into the United States. The world of finance is not as simple as some would have you believe. Sometimes a foreign entity is formed to allow foreign investors to invest in the United States, which may well be the case with the entities that Democrats are describing as foreign accounts." Romney revealed little else during his interview with Costa, saying that what he's looking for in those he's considering for vice president are people with the "capacity to lead, who share my philosophy, and, in some cases, people who provide perspectives and skills that I may not share." He said his experience at Bain prepared him for the presidency by giving him "an understanding of how business decisions are made, as well as an understanding about the actions that are destructive to job creation and the actions that encourage job creation." Asked by Costa why he's going to Europe next week, Romney said, "Foreign affairs and associations with foreign leaders are an important part of the presidency, a position I hope to achieve." Later Tuesday, the editors of the National Review called on Romney to release his tax returns, respond to attacks "and move on." "We doubt that there is anything truly surprising in Romney's additional personal tax returns," they wrote in an online editorial. "We already know that he has made vast amounts of money, that he gives generously to his church and to charities, that he has set up trusts for his family, that he maintains bank accounts and investments overseas, and that he takes advantages of such benefits as are available to him under our ridiculously complex tax code. "But there is no scandal in that. Romney is a wealthy man — and he has complicated personal finances, something that is typical of wealthy men." Releasing pre-2010 returns, they said, would allow him to focus on "where he wants to take the country." "By drawing out the argument over the returns," the editors wrote, "Romney is playing into the president's hands." They also dismissed Romney's defense that he has released as many returns as Democratic presidential candidate John Kerry did in 2004 and that Kerry's wealthy wife, Teresa Heinz Kerry, released none. "Neither is an apt comparison," the editors said. They noted that when Kerry was running for president, he released returns from 1999 through 2003, and had already released tax returns during his Senate runs. "As for Teresa Heinz," the editors said, "Romney isn't the wealthy spouse of a candidate, but the candidate himself."